While some are born with natural advantages, the workforce doesn’t have to be survival of the fittest. 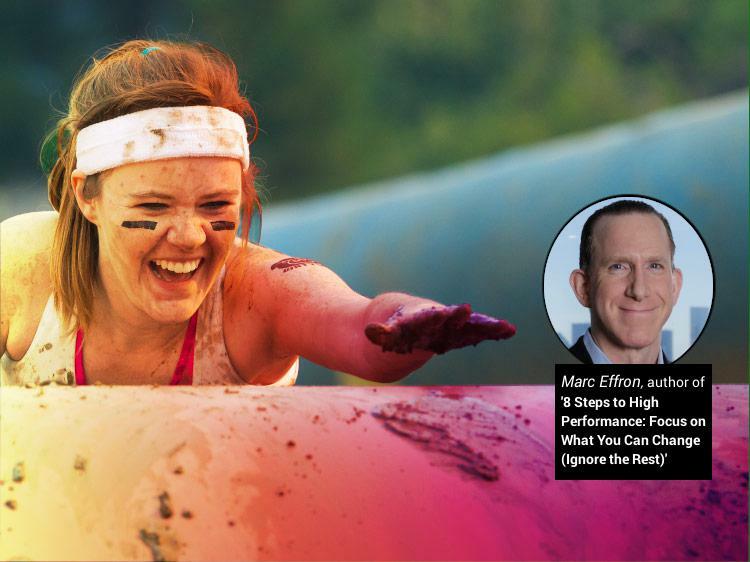 ‘8 Steps to High Performance’ author Marc Effron says the things you can control matter more. Overcome your disadvantages to move forward in your career. Not to quibble with so august a document as the Declaration of Independence, but let’s get real: Are we all really created equal? Of course, everyone deserves equal rights, but the hard truth is that we aren’t all born equal. Some people are born smarter, or to more highly educated parents, or meet society’s standards of beauty, or have that “winning” personality—or all of the above, the genetic equivalent of winning a Power Ball lottery. As founder and chief of global consulting firm Talent Strategy Group, Effron spent years combing through research on what really makes people perform better at their jobs. To write his new book, 8 Steps to High Performance: Focus on What You Can Change (Ignore the Rest), he selected only the most scientifically solid conclusions, dismissing “studies using rats and undergraduates.” What he found was that some inborn traits may be less of a disadvantage than you think. Monster recently spoke with Effron about how focusing on what he calls the “flexible 50%” can supercharge your career. Q. The first of the eight steps in the book is setting big goals. Why is it better to have a few big goals than many small ones? A. We’re hardwired as humans to respond to a bigger challenge with a bigger effort. That tends to produce bigger results. But it also means that having too many big goals can distract you. Doing three things extremely well is much better than struggling to achieve six, or eight, or 12. Q. We often hear that asking for feedback is crucial to improving performance, but you say “feedforward” is even better. What is that? A. The idea comes from [productivity expert and author] Marshall Goldsmith, and it makes a lot of sense. Feedback is often useful, of course, but it’s based on what you did or didn’t do in the past—which, obviously, you can’t go back and change now. Feedforward, by contrast, is about the future, which is within your control. Ask people who know you well, whose opinion you trust, “What one suggestion do you have for me about what I should start, stop, or continue to do?” You don’t have to act on every suggestion, but for the ones that work, thank the person who gave you the advice. This makes them more willing to give you insights in the future, so you’ll keep on improving. Q. You recommend “faking it” to get ahead at work. Why? A. Your company’s needs are constantly evolving, and different behaviors are required as you move up in your career. So your genuine self just isn’t effective or appropriate in every situation, and sometimes, you’ll need to behave in ways that aren’t part of your natural style. The research shows that this is especially true when you’re trying to emerge as a leader, meaning you need to get noticed for your accomplishments and build relationships with important people above you. Some aspects of faking it—like never criticizing your boss or socializing with higher-ups at company events you’d rather skip—might seem like playing politics or sucking up. But it’s clear, both in the research and in everyday life, that these things differentiate people who succeed from everybody else. Q. Does “faking it” apply to networking, too? A. It can. Introverts, for instance, may want to fake being more extroverted since extroverts connect so much more easily with others—and the research shows that people with larger networks have higher salaries, more promotions, and greater satisfaction in their careers than their peers who aren’t as outgoing. Q. When studying the productivity research, what surprised you the most? A. I thought that physical exercise would turn out to be more important to job performance than it is. It’s true that being in poor physical shape can indirectly hurt your performance by causing more health problems as time goes on. But beyond that, it turns out that more trips to the gym won’t meaningfully benefit anything other than your waistline. Who you are and where you’re from shouldn’t be factors when it comes to finding a good job, yet it can sometimes seem that way. Want to give your job search a major advantage? Join Monster for free today. As a member, you not only get job alerts emailed right to your inbox, which cuts down on the amount of time you’d spend combing through ads, but you can upload up to five different versions of your resume—each tailored to different types of jobs that interest you. Recruiters search Monster every day looking to fill top jobs with qualified candidates, just like you.